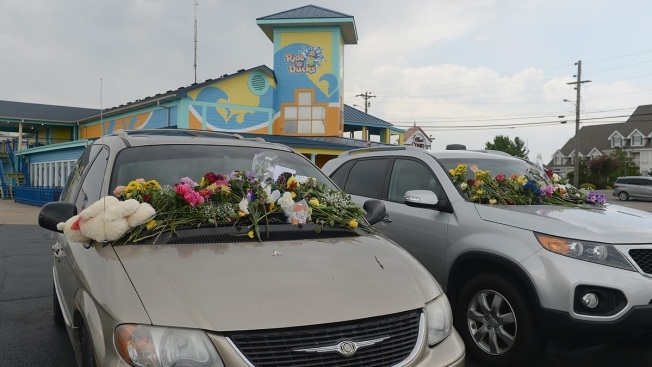 In this July 20, 2018, file photo, vehicles of the victims of the Branson Duck Boat accident have been turned into a memorial on the parking lot for Ride The Ducks in Branson, Missouri. Hundreds of mourners stopped by the location to pay their respects to the victims after a duck boat capsized in Table Rock Lake in a thunderstorm. Duck boats are repurposed military vehicles. The same ones in the water today date back to World War II. Duck boats have been turned into popular tourist attractions throughout the U.S. However, duck boats also been involved in dozens of deadly crashes on sea and on land. The 17 people killed when a tourist boat sank in a Missouri lake were remembered Sunday during a service attended by hundreds of people in the tourism community of Branson. A church bell at Williams Chapel at College of the Ozarks chimed 17 times for those who died Thursday at Table Rock Lake. More than a dozen survivors of the tragedy, along with their family and friends, filled the front pews of the church to organ music. Although a patrolman guarded their privacy, he allowed one attendee, Carmen Lawson, to deliver pink and red roses after the service to surviving members of a family that lost nine members. "It was such a tragedy," said Lawson, 61, of Branson. "I feel for the family." Branson Mayor Karen Best recalled the desperate family members who turned to City Hall for information about their loved ones. "We started putting faces with names. Those who were once strangers to us quickly became family," Best said. "They were a part of our community. And we did what families do. We held hands, we wept and we prayed together." She praised the people who tried to save others from drowning, calling them "heroes who did everything in their power to save lives." "Today we are all family," said College of the Ozarks President Jerry C. Davis. "We are here to comfort those who have been affected by this tragedy in so many, many ways." Online fundraisers had raised more than $400,000 for the Indiana family's funeral expenses by Sunday afternoon. During the closing benediction, Nixa Fire Chaplain Steve Martin said of the victims that while "most of them are visitors ... they are not strangers to us."